In Japan, the designation “Living Treasure” recognizes those artists who achieve mastery of their country’s ancient crafts and traditional skills. 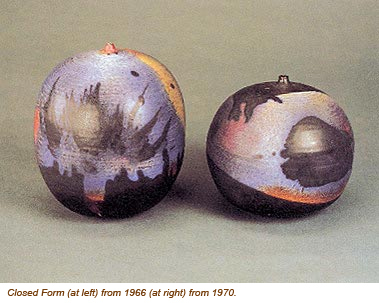 America has no similar honorific for its own artistic masters, but in the case of Toshiko Takaezu, perhaps one needs to be coined. As both an artist and a teacher, Takaezu has enriched and ennobled her metier to a degree that few other ceramists have achieved. Born in Hawaii to immigrant parents, she was the product of a number of cultural influences, all of which converged in the singular artistic sensibility that informs her work. When she sets her hand to even a simple bowl or pot, the result is an object that evokes the essence of the disparate elements that have shaped her life: her Japanese ancestry, her South Pacific childhood and education, her exposure to Scandinavian design, to name but three. Takaezu studied under the noted Finnish ceramist Maija Grotell, from whom she absorbed a deep appreciation for the purity of minimalist design. 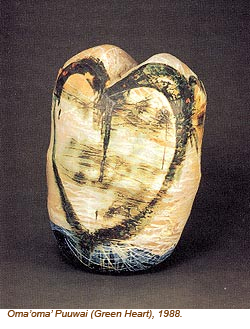 In 1955 she joined the faculty of the Cleveland Institute of Art’s ceramics department. That same year she spent eight months working with master potters in Japan and delving into the philosophical underpinnings of Zen. Much of the spiritual significance of her creations would ultimately derive from those months of immersion in her ancestral culture, as would her teaching style: demanding, but always generous and inspiring. Melding her affinities for pure shapes and spare, uncluttered designs, Takaezu developed the concept of the “closed form,” which became her signature style. Nonfunctional objects more akin to statuary than pottery, her “closed form” creations are almost sculptural in intent. Pared down, minimalist variations of the potter’s standard vessels and containers, Takaezu’s works often display glazes of understated ochers and blues. Others sport colors reminiscent of the lush and vibrant surroundings of her childhood, with exuberant pinks, green and yellows recalling the tropical flowers of her native Hawaii. 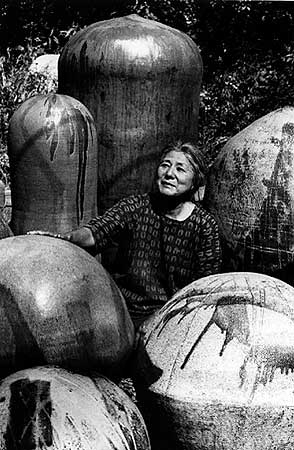 After Takaezu left the Institute in 1965, she moved to New Jersey and joined the faculty of Princeton University, where she taught until her retirement in 1992. Her work continued to evolve throughout her career, moving inexorably toward more frequent references to the natural world and the harmonious relationships within it. Over the years her creations have been featured in nearly 100 exhibitions around the world, and she has received honors from, among others, the National Endowment for the Arts and New York’s American Craft Center, which in 1994 presented her with its Gold Medal Award. Her work is in the permanent collections of the Metropolitan Museum of Art, the Philadelphia Museum of Art, the Museum of Fine Arts, Boston, the Smithsonian Institution, and more than a dozen other museums.